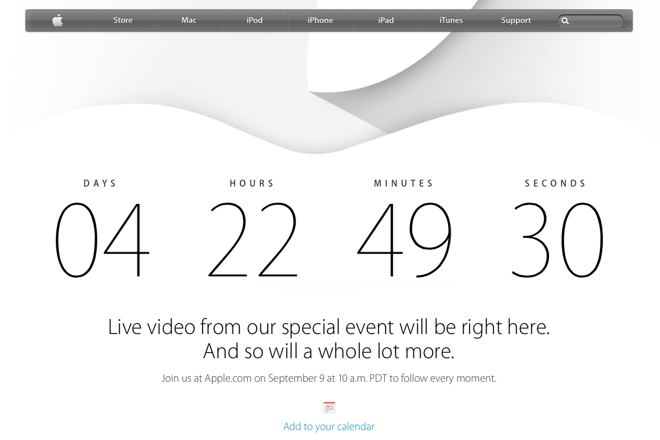 With less than five days to go until Tim Cook takes the stage at the Flint Center in Cupertino, Apple has begun promoting the event— at which the iPhone 6, iWatch, and perhaps second-generation iPad Air will be unveiled —on its homepage with a countdown timer to the live stream. "Live video from our special event will be right here," the page reads. "And so will a whole lot more." The company then implores users to tune in to "follow every moment" and provides a quick iCal-compatible shortcut to add the event to a calendar. Apple announced the Sept. 9 event two weeks before it is to be held, an unusually long lead time that suggests it may view the announcements as significant. Apple generally gives journalists a one-week notice. Additionally, rather than holding the press availability at its now-traditional venue —the Yerba Buena Center for the Arts in San Francisco —or its own on-campus theater, Apple chose to move to Cupertino's Flint Center. The Flint Center holds nearly 3,000 people, nearly three times as many as the much smaller Yerba Buena theater. Adding fuel to the fire is Apple's construction of a large, two-story building on the grounds of the Flint Center. The building's purpose remains unknown, though many speculate that it will play host to an enhanced and enlarged version of the "hands on" area where the company traditionally allows journalists to fondle new products. AppleInsider will be on hand at the Flint Center next Tuesday and will bring live coverage from inside the venue.